ESD suppressors are semiconductors that protect electronic components and systems from electrostatic discharge (ESD), the sudden and uncontrolled transfer of an electrical charge between conductors. They are installed near the protected line and connected in parallel with the signal line. Most products consist of diode arrays. ESD suppressors protect static-dissipative equipment from overvoltage transients by clamping voltages to levels which circuits can withstand. They shunt the majority of the ESD current away from the data line to a reference, usually the power rail and chassis ground. During production, transient voltage suppression (TVS) increases chip yields according to standards such as charged device model (CDM) and machine model (MM). During end-use, ESD suppressors protect electronic products such as cell phones, personal digital assistants (PDA), and computers according to test methodologies such as IEC 61000-4-2 from the International Electrotechnical Commission (IEC). Specifications for ESD suppressors include peak pulse power, maximum reverse stand-off voltage, maximum clamping voltage, maximum peak pulse current, and maximum off-state capacitance. When there is a high degree of separation between the signal frequency and unwanted frequencies, low-capacitance ESD suppressors provide valuable filtering functions. With high-speed signals, however, higher-capacitance can filter out data and produce distortion. Consequently, low-capacitance ESD suppression systems may be better suited for high-speed data lines that use protocols such as universal serial bus (USB) 2.0, Gigabit Ethernet, and InfiniBand(R) (InfiniBand Trade Association). SOT23 is a rectangular, surface mounted, small outline transistor (SOT) package with three or more gull-wing leads. SOT23 features a very small footprint and is optimized for the highest possible current. 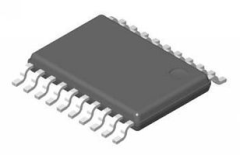 SC-70, one of the smallest available IC packages, is well-suited for applications where space is extremely limited. Quad flat packages (QFP) are flat, rectangular ICs that contain a large number of fine, flexible leads which project from all four sides of the package. They provide excellent power dissipation per unit area compare to leaded packages. Small outline diode (SOD) packages include SOD-123, SOD-323, and SOD-523. ESD suppressors that use the small outline integrated circuit (SOIC) package have two parallel rows of pins in a surface mounted package. ESD suppressors must adhere to certain standards and specifications to ensure proper design and functionality. Additional specifications can be found at the IHS standards store. AFLCR 65-8 - Maintenance - Engineering. Electrostatic discharge (ESD) control program. ANSI/ESD SP14.1 - System level electrostatic discharge (ESD) simulator verification. ASTM F1812 - Standard test method for determining the effectiveness of membrane switch ESD shielding.